Create a Group for your analysis - FAQ. This step is optional. You can also use your default/existing group. What is a Group? A "Group" contains Databases and Projects and controls access to all content within. You control access to your Group(s), and who is a member of your group. You can also belong to multiple Groups (i.e. collaborators). Create a Database for your analysis - FAQ. This step is optional. You can also use your default/existing database. What is a Database? A Database contains Tracks, Lists, Sample Sets, Samples, and Files. Each database can be associated with a reference genome. Create a Redmine Project for your analysis - FAQ. This step is REQUIRED. What is a Redmine Project? The Redmine Project holds files (HTML, plots, etc) that contain analysis results from your tool. What type of files can be uploaded? 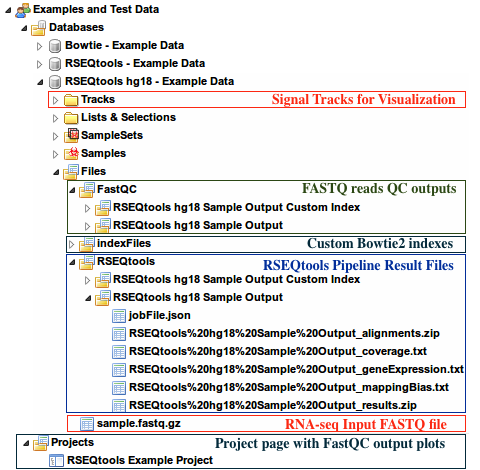 The long RNA-Seq pipeline using RSEQtools accepts a single-end or paired-end FASTQ files as input. The input files can be compressed. Drag Single or paired-end FASTQ files to Input Data panel. The input files can be compressed. Drag a Database and a Project to Output Targets panel to store results. Select Transcriptome » Analyze RNA-Seq Data » Analyze RNA-Seq data by RSEQtools from the Toolset menu. Submit your job. Upon completion of your job, you will receive an email. Download the results of your analysis from your Database. The results data will end up under the RSEQtools folder in the Files area of your output database. Within that folder, your Analysis Name will be used as a sub-folder to hold the files generated by that run of the tool. Click on your results file(s) in the Data Selector panel. Select the link Click to Download File from the Details panel to download your results file(s). View plots from the Projects page. Click on your project name in the Data Selector panel. Click on Link to Project in the Details panel to view your Projects page. Drag your Database to Output Targets panel. Select Data » Databases » Unlock/Lock Database from the Toolset menu. Click Submit in the Setting Dialog box to unlock your database. Drag your Database to Input Data panel. Select Visualization » UCSC Genome Browser from the Toolset menu. Select the signal tracks with bigwig files (already made by the pipeline). Click Submit in the Setting Dialog box to create the link to visualize the selected tracks in the UCSC Genome Browser. Click Launch UCSC Genome Browser link in the dialog box. differentiation of human embryonic stem cells into the neural lineage has been used in this example. and to a splice junction library generated from the UCSC Known Genes annotation set using Bowtie2. The mapped reads are then analyzed using various modules in RSEQtools. Signal tracks are uploaded under the Tracks section of this database. (representing exons, transcripts, or gene models) mrfQuantifier calculates an expression value for each annotation entry. This is done by counting all the nucleotides from the reads that overlap with a given annotation entry. Subsequently, this value is normalized per million mapped nucleotides and the length of the annotation item per kb. 1 denotes the 3' end of the transcripts. This analysis is done in a strand specific way. fraction of transcripts (specified in annotation file) that have at least -times uniform coverage. WIG file are normalized by the total number of mapped reads per million. Only positions with non-zero values are reported. Lukas Habegger, Andrea Sboner, Tara A. Gianoulis, Joel Rozowsky, Ashish Agarwal, Michael Snyder, Mark Gerstein. Langmead B, Salzberg SL. Fast gapped-read alignment with Bowtie 2. Nature Methods. 1000 Genome Project Data Processing Subgroup. 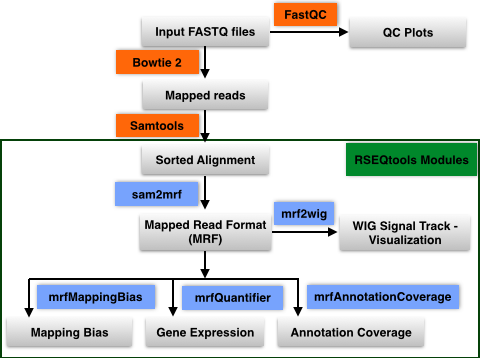 The Sequence alignment/map (SAM) format and SAMtools. at the Bioinformatics Research Laboratory, Baylor College of Medicine, Houston, TX.